You may also pick up booklets for $2 each at Discover Klamath, 205 Riverside Dr, Suite B, Klamath Falls, Oregon and Tule Lake National Wildlife Refuge, 4009 Hill Road Tulelake, California. The Klamath Basin is also a great place for humans needing relief from the hustle and bustle of big city living. We call it a refuge..for more than just birds! Fall: August and September are peak months for viewing Pelicans, Egrets, Herons, and Grebes. An estimated one to two million ducks and geese migrate through the Basin each October and November. Winter: From November through February over 500 Bald Eagles - the largest concentration in lower 48 states - winter near Bear Valley Roost in the Klamath Basin. Spring: March to May brings shorebirds and waterfowl migrating north to Alaska and Canada. 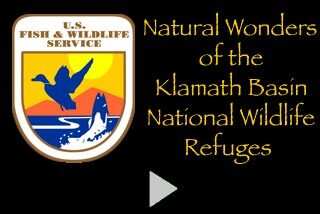 Thousands return to nest in Klamath Marshes. "Secure Rural Schools and Community Self-Determination Act of 2006."